Jimmy loathes his job and parents. He seeks solace with his mod clique, scooter riding and drugs, only to be disappointed. I'm almost finished reading Pete Townshend's autobiography "Who I Am" and have been listening a lot to the Who's original double album of the same name so the time was right to finally watch the big-screen dramatisation of the record. I'm just a bit too young to remember anything about the vicious Mods v Rockers pitched battles at Brighton or the Mod lifestyle (I'm not sure just how far north it made it up to Scotland, it always seemed to me principally a London-based movement). Nevertheless, the broader themes in the film of the generation gap between teenagers and their parents, the pain of rejection, youthful revolt against authority plus the less intellectual need for young kids to get drunk, drugged, violent and sexed up are universal and seemingly constant, which with the background of great 60's music, made for an engrossing and enjoyable if occasionally challenging watch. This is Phil Daniel's Jimmy Fenton's worm's eye-view of life in the mid-60's, working in a dead-end job, out of touch with his parents and although on the face of it, there doesn't appear to be much to rebel against, sure enough, he loses his way and his mind as he suffers rejection from his employer, said parents, would-be girlfriend Leslie Ash and after seeing his Mod Hero '"ace-face" played by Sting, meekly conform to society mores carrying bags at a hotel, he gets pushed over the edge (literally). His only way out of the tormenting feelings he's experiencing for the first time sadly involve just a one-way ticket. 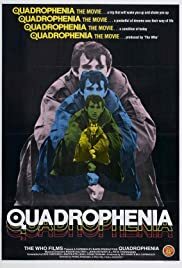 The film adopts a realistic, warts and all approach, with no let-up in the levels of bad language used, scenes of drug use (although it is "only" pill-popping "uppers" or "blues" as they're called in the film) and of course the centre-piece of the film, the recreation of the infamous Mods and Rockers "Battle Of Brighton" of 1965. There's some earthy humour though to leaven things, particularly two Mods encounter in the dark with a bunch of sleeping rockers, although one or two stray elements of sentimentality (Jimmy's heart-to- heart with his long-suffering dad, his friendship with an old pal turned rocker) slightly jar. Fan as I am, I could have done too without the too obvious genuflecting to the film's producers The Who (Jimmy putting on the "My Generation" single at a party, then gazing in awe at the band on "Ready Steady Go"), I guess he who pays the piper and all that. Central to the movie is a superb performance by Daniels as Jimmy, his mood-swings oscillating violently as he takes or comes off his pills, wired to the moon as we say today. His energy and vividness set the tone for the whole film. Interestingly director Franc Roddam (later the creator of "Auf Weidersehn Pet" and, ...er "Masterchef" on TV), changes the ending and placement of songs from the album, but there's no denying the memorable climax to the piece. In the end I was transported not only back into the era depicted, but more importantly into the head of "helpless dancer" Jimmy and would state that the movie well complements the great album The Who originally released, a rarity in "rock" movies.